Today, Open the Government and the Project On Government Oversight are calling for Congress to question Secretary Kirstjen Nielsen about her statements made under oath regarding the administration’s practice of separating children from their parents at the border. OTG and POGO recently obtained an internal memo in response to a FOIA request that contradicts statements made by the Secretary, and demands further investigation into the administration’s policy behind the crisis that continues today. 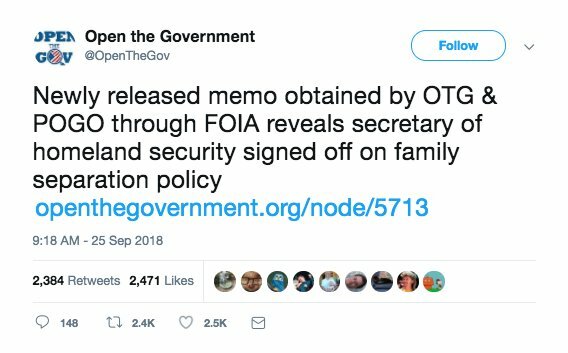 The April 23rd memo obtained by OTG and POGO provides evidence that, contrary to her statements, Secretary Nielson directly signed off on the policy of separating families with full knowledge that the purpose was to deter migration. Request (by subpoena if necessary) an unredacted copy of the April 23 memo; the legal analysis from the Department of Homeland Security’s General Counsel that it references; and all other documents that Nielsen sent or received regarding “zero tolerance” prosecutions and family separation. Require Secretary Nielsen to come before the committee under oath to provide an explanation for her prior inaccurate testimony, her failure to correct it, and her other false statements regarding family separations. If deemed appropriate after a thorough examination of the factual record by the Committee, make a referral to the Federal Bureau of Investigation for investigation of potential violations of 18 U.S.C. § 1001. Read the full letter here, and the recently released memo here.